"An easy way to gather intel on competitors"
"Easy to use tool to gauge your org against competitors"
I can easily and quickly see how my org stacks up to competitors. Also, I can set up custom reports and custom alerts that notify me of what my competition is doing in real-time. Additionally, the interface is easy to use. I would like to customize reporting even further, but I think they are working on this. It saves time and energy. We can use one dashboard to get all the info needed on competitors at one time. We can benchmark against goals and against competitors. Our team loves the ability to enter competitive handles and track performance across the landscape. The charts available have been very helpful to the clients. There really is nothing that I dislike about this tool. Take a look at the tiered packages they offer when deciding what your client really needs. They offer a monthly fee instead of a full year, so this could be a way to sell it in to clients as a trial if they currently don't use any tools or are hesitant. One of the biggest benefits that we have found is the ability of Rival IQ to use machine learning to identify which posts our competitors are likely boosting with paid dollars. This helps us make a case to clients to continue to utilize paid and also helps inform our overall strategy. Rival IQ allows you to track your competitors' social media accounts and compare your progress with them. I'd like to be able to see the reach data of our company's social media as well as the data that is used to compare to competitors. The software is not your typical social media reporting software. It does not have reach data for example, it only has public data so that you can compare to your competitors. 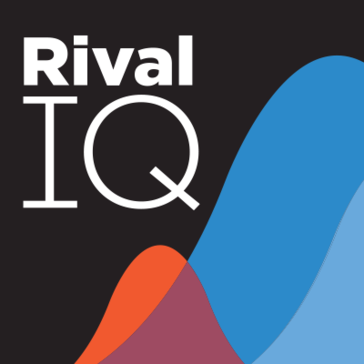 We are using Rival IQ to track our social media engagement against our competitors. It has helped us create benchmarks for progress based on what our competitors are doing. "Amazing product for aggregated digital and social analytics, monitoring, and reporting." Product functionality, roadmap, and continual updates to the platform. Their platform is incredibly robust and they are constantly rolling out new features, updates, and advanced reporting and analytics. Rival IQ has built in some amazing integrations with social platforms. It's been tremendous to compare multiple accounts in aggregate and against competitors. Their original custom reports section was not very robust, but they have made big improvements lately that have made their custom reporting really great. My only feedback would be for continued work on custom reporting and dashboards, which I believe they are still working on. We use Rival IQ for competitive tracking and tracking our portfolio companies. Rival IQ made it easy for us to aggregate social and digital monitoring across multiple channels and companies into simple, easy reporting. Rival IQ is also really beneficial in helping us determine what content is working and not working on our social channels and where we can find the most value in our content. "Great Service...but way too expensive"
Rival IQ prices are out of the market, and even worst they do not respect previous agreement with loyal users that have been with them for years. Robust for social analysis (both for your own client/website but for competitors too), but there's some pretty cool stuff in the "web" section. The alerts give you a list of the changes to your property or that your competitors have gone through, including updates to titles/descriptions, social bio updates, breakout social posts (ie highly engaged-with content), and another report even gives you a snapshot every week of a particular website so you can see changes over time. The SEO section is pulling in data from the SEMRush and Moz API's and if you already have access to these tools, it's not as helpful. Rival IQ seems to do everything well, but doesn't specialize in one particular aspect of social media monitoring or anlaytics. If you're looking for a specific use case, you might want to go elsewhere. We needed a social analytics and listening tool that integrated insights for clients and their competitors. Rather than pull data from multiple sources, we can just visit the dashboard of Rival IQ. "Great tool for high level competitor insights in the social space"
I like to be able to easily track my competitors social pages in an easy dashboard and set it up with the information I need. I also like that I can incorporate my FB ads manager into the platform to pull owned ad data in. I would love to see more functionality with ads from competitors. I know this is not realistic but it would be nice is FB ever opened that up. Also engagement rates are calculated very different than the actual platforms making it difficult to use. If you're looking for any easy way to compare your social platforms against competitors or dig into specific companies for new business it's a great tool. Keep in mind it is only pooling what in on the social page and does not incorporate ad buys from competitors. Competitive analysis for multiple brands as well as new business pitches. Benchmarking our clients' performance (we are a small digital agency) against their peers, competitors and others in their "landscape" is amazingly useful and easy. I wish "self-reporting", meaning reporting on one client for that client, were easier and more comprehensive. You can isolate a client by tagging them (or others) but the whole concept of landscape falls apart in a one company profile. Great for comparing one organization's digital presence against others. Not so great for one organization tracking its own progress against itself. With RivalIQ we can show clients how they "stack up" on social/digital against their peers or competitors. This is certainly an important part of our strategic planning and counsel. Plus we can benchmark progress against our goals for the client. "RivalIQ makes our data gathering so much easier"
I like that I can easily see spikes in our competitors social networks and make a good guess as to what caused the spike and replicate on our channels. We are able to easily track growth across platforms, assigning value to certain campaigns in an efficient way. Tracking brands that have the same target audience as us allows us to really understand our customer interests outside our product offering. Then we get to promote similar lifestyle experiences and content, knowing that it will be appreciated by our followers. Since using Rival IQ we have grown our total social reach by more then 150%. There really isn't anything. The only thing I would want is to integrate a posting feature like Sprout Social so we can switch to using one single platform for posting, tracking, mulitplatform response and analytics. Adding in new platforms in the future will be critical - periscope / snapchat. It will save you so much time aggregating data. The ability to have all my necessary data in one place. "Excellent for Competitor Research and Impressing Clients"
Its value comes in its competitor research. You can easily see the campaigns they're running as well as their top posts. The price unfortunately, the monthly price is steep for small companies. Also for this price, it feels more like an additional than a stand-alone product. There are some metrics and integrations I would like to see more of to show our clients. Use it for competitive research as well as hashtag research. Being able to search a custom date range is also helpful on the paid version. This is extremely helpful when pitching clients as well. Performance of our current campaigns and also viewing what our competitors are doing. "Get Ahead Of Your Competition"
I love being able to see what my competitor's social media campaigns are looking like with a capture in an instant. New features and the ease of use are huge for me. I would like to see improvement on the dashboard. I would also like the chat box removed at the lower corner. It would be nice to have that out of my way of the dashboard. Definitely give Rival IQ a shot! They are an amazing company with a great product! Time. I am saving the most valuable resource I have...time. The benefits I have realized is that it is important to watch your competitors and see what additional value you can give to your clients and prospects which they are either dropping the ball on or have not considered. Rival IQ is a complete service for benchmarking on social media. You get all the info in one place, compare them and all that with an awsome price, it fits in most agencies budget. And what is very cool, you talk directly to the CEO. At the moment there is nothing I dislike in the product. If you need an easy to use service, to get all your data together (and data form your competitors) and then use them to Social Media Intelligence, I recommend this for you. We are using it for benchmarking. It´s very easy to have your own insights with the data so well organized into beautiful dashboards. I really think that this solution is cheaper than it should be (I am serious), I have tested many others more expensive than this and they didnt do what Rival IQ does. "An excellent product, backed by superb service. Just perfect!" The product is perfect for my needs, allowing me to measure the performance of my brand against key competitors. There is nothing I like dislike. Even the 8 hour time difference is not a real issue. Talk to them. You'll be impressed. Get a free trial at a time when you can devote a few hours to understanding what it can do for you. You'll be even more impressed. Knowing how my brand is performing in social media against key competitors. Having access to the data has made me up my game, and helped me improve the brand's position substantially. "Must use for smart and busy marketers"
They have no limit on adding/removing companies to landscape during the month unlike most of other services. High price. Although it's reasonable related to similar services. When u have a problem or want a help, always contact their customer support they're very responsive and always seeks happiness of customers. With RivalIQ, I'm capable of rapidly listen and monitor competitors activities on social and digital landscape while smartly create cross-channel reports of my clients' activities on digital landscape. "The best platform you've never heard of"
Not much...I wish it would allow you to benchmark more than just social. Give it a shot, you'll be amazed by what you can learn about your own efforts by watching your peers. We're able to see where we stand versus our peers and be more effective with our social efforts. "Would be more helpful with LinkedIn"
Easy to read stats. Easy to navigate dashboard. Does not gather LinkedIn data. Not their fault, but the only platform we care about. Great as long as you don't need LinkedIn data. Most of our customers are on LInkedIn so that is where I am really looking for engagement. What I have found working with RivalIQ is that their product does not meet my needs, through no fault of their own. Shows our top posts as well as our competitions. We can see what we're doing that's different vs what they are doing. Only has engagement analytics and not reach or impressions. "The only competitive owned social analytics tool you'll ever need." I can't say enough good things about Rival IQ. Phenomenal product vision and direction. Solves tons of problems - from quick insight into the 3 main metrics for social media (audience, activity, engagement), to rapid report development. They're working on marrying all digital analytics into one platform, such as SEO and paid search advertising analytics - they've got a start at this with some Moz and SEMRush data in the platform. The interface has some work needed, just in the sense that there are too many great things to do with it and it's hard to find where to do them. But this will be fixed soon I'm told. The founders, John, TA and two others, are incredibly involved and ready to talk with you. Don't hesitate to chat with them. They have made so much time available for us and continue to surprise me with their care, attention and drive to take over the market for social analytics with this product. DO NOT USE SIMPLY MEASURED. Or quintly. Or anything else, really. Those are priced way too high or way too annoyingly for agency or even major brand purposes. Rival IQ has simple pricing. They're awesome people. It's an incredible product. I know giving full scores to everything seems fishy, but there is nothing better and there is really nothing bad I have to say about it. Social marketers everywhere need quick insight into performance, especially compared to their industry and competitors. Franchises need to see a ton of social properties at once. Social marketers don't have much time, and manually finding URLs to competitors' social networks is annoying (Rival IQ does it automatically when you type in a competitor's website). Rival IQ solves ALL of these and more. "The data you need, fast, easy, and affordable"
UX and UI not quite where it needs to be yet. Don't have access yet to the full complement of social channels. If you need a massive, enterprise-grade solution, you might look at TrackMaven, SocialBakers, SimplyMeasured. But for mid-market these guys have a great QPR. Lots of use cases for RivalIQ, but in my company we mostly use it to find best-performing social media content from among a competitive set. Very helpful in tailoring social editorial calendars and content plans. You can see how your social posts compare to your competitors with one click. Their charts and data make for easy viewing and analyzing by you and your client. There is a limit on the amount of competitors you can insert at each price point. We are able to streamline a lot of data pulling while at the same time learning valuable insights about our clients in comparison to the rest of their industry and market. 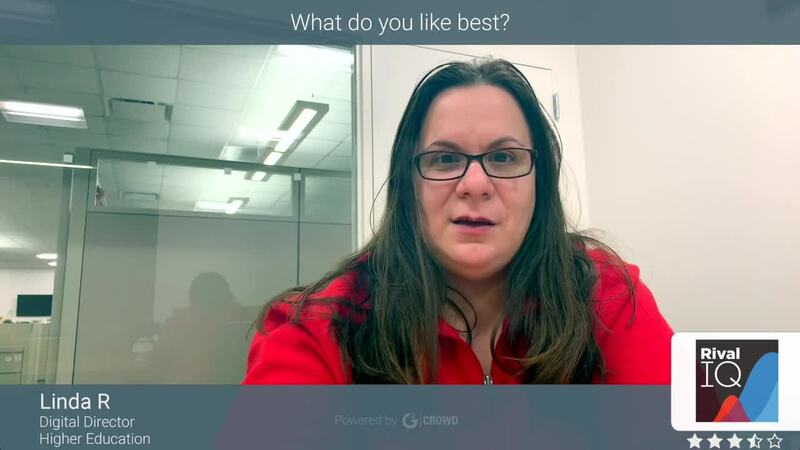 "Rival IQ is one of the most important tools in my social media toolkit"
Don't have any dislikes about this tool)) there is always a room for improvement and they can add other social networks like Pinterest. Data for a wider date range would be great. set up landscapes not only with your direct competitors, but also other landscapes with companies that post similar content that you do, see what works for them. this tool is not only about direct competition, it's great to track how you grow compared even to some bigger brands. you can be amazed at how well you work and also show those results to your management. Competitor research is essential for me, I want to know what my competitors are up to, what their audience likes best. I also clearly see how brands position themselves on social media and get notified when they change their description. Knowing how others present themselves it's easier to differentiate and we've eveloped our own voice and strategy also with the help of Rival IQ. Do it now, before the price hikes! "Great tool for competitive analysis"
The tool does a great job of visualizing data and comparing brands. Social, SEO and SEM competitive analysis. We were doing a lot of this analysis manually but RivalIQ helps pull it all together quite easily. Easy to use but oh, so powerful. Makes sense of all the real world social data and presents it in such a way that we can deliver a great service to OUR customers. There really isn't anything to dislike - it's a great product with useful new features on a regular basis. Try it out - you'll be amazed! Gathering data for our clients which then informs their strategy. We've saved a mass of time and have more to show for it. "Great tool for benchmarking your social performance." I really like how clear and easy to use the platform is. The downloadable PDFs and Powerpoint formats are also very useful. The way the numbers are presented are very easy to understand, even for those not familiar with social media. I wish that I could export the raw data as a CSV or excel file. To benchmark and easily measure our social performance. The ability to benchmark your clients against competitors and know what it takes to consistently be more effective. I don't like tomatoes and sweet potatoes. If you have clients ever questioning social, show them this. The people that are blind to social and its effectiveness. You can not argue against actual data. "Simple, useful and Very good!" Simplicity on usage, great insights and suberb product support. Detailed reports on Social Media insights of our clients and their competitors. Making sure clients understand what is working and what is not. The data provided is both accurate and is presented in a comprehensible and report-ready way. I can hone in on competitor's content as well as my own and compare side-by-side. The team is also incredibly involved. Unfortunately, they don't take Pinterest into account. Rival IQ has helped save massive amounts of time by compiling the social channels of all our competitors, potential investors and more in one place. I've been able to better understand and serve our own audience by better understanding our competitors. "RivalIQ has been key to our strategic decision making"
We use RivalIQ to organize and monitor our competitive landscape. For each indirect or direct competitor we know about or discover, they are added into RivalIQ, tagged and then we receive email alerts and can build report based on activity like Twitter engagement. I really like how the analysis is relative to your own company. Single user app today, needs support for team members. By segmenting and organizing our competition in landscapes, we are able to strategize better as a team. "Free trial + Visual Graph "
The visual graph it can generate is really powerful. You can add your competitors to compare the social performance with those of yours. The solution part is not as strong as the analysis part. * We monitor all Rival IQ reviews to prevent fraudulent reviews and keep review quality high. We do not post reviews by company employees or direct competitors. Validated reviews require the user to submit a screenshot of the product containing their user ID, in order to verify a user is an actual user of the product. Hi there! Are you looking to implement a solution like Rival IQ?